The Gutter Cleaning Company gives our customers the best gutter cleaning service for very affordable prices. Whether it's Spring with it's tree buds and helicopters, Fall with leaves or Winter with ice, clogged and overflowing gutters can cause significant damage to your home. Please call early for prime spring appointment times. We cannot clean gutters when the temperature is below 32 degrees. 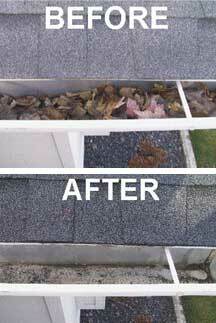 We are unable to remove frozen leaves from your gutters.